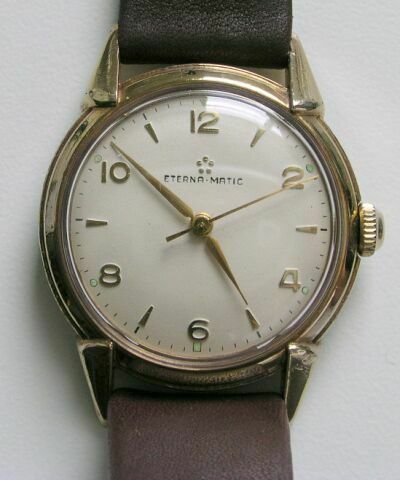 ETERNA MATIC Automatic 17 Jewel movement. The movement is a "1247UC" (ETA 1256) and it has been completely disassembled and cleaned in a watch parts cleaning machine, the shock jewels of the balance assembly have been pegged and cleaned and the parts were properly oiled when the watch was reassembled. 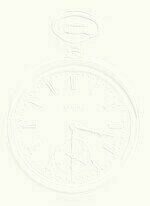 The watch was worn for a week to make certain that the weight would wind the watch from normal wear and the watch keeps accurate time. The dial and the hands were refinished and are in excellent condition. Gold colored hands and hour markers. The case is a Wadsworth 14 K Gold Filled. The case has been electroplated to cover wear spots. The screw-back is worn and it is sealed to prevent leakage. The sealant is the same as used to seal crystals, it should be used to keep the case leak resistant. 34mm case, lugs 18mm. Case back is very shiny so the picture isn't the best. # 1164 $ 195.00 + shipping.